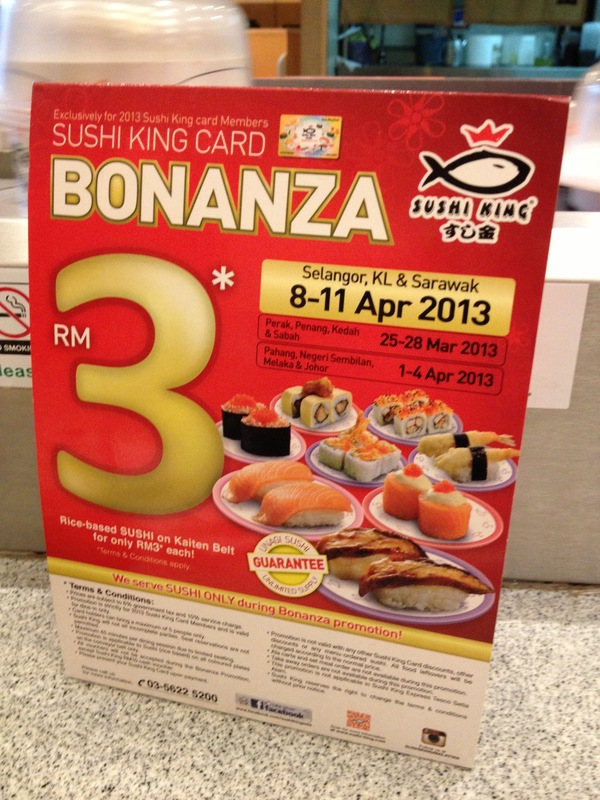 Sushi King Bonanza will be RM3? Another Bonanza is coming to KL and Selangor next week, from 8-11 April 2013! But…. Yesterday I went to eat sushi in Sushi King plaza Lowyat, and saw this advertisement about Bonanza. Bonanza is the time when Sushi King sell all of the sushi (containing rice) in the kaiten belt, in a fixed price. I was really excited when I saw the banner, but I felt there’s something different with the bonanza this year. Whattt? It’s RM3 per plate! They’re increasing the price by RM1, usually they’re selling it at RM2 each plate. Well, I don’t know maybe there’s an inflation or it’s just another marketing strategy by sushi kin sdn bhd, but in the kaiten belt’s normal price, the lowest plate’s price still cost the same, which is RM2.